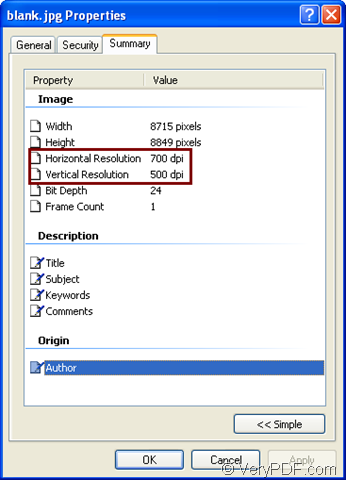 Please don’t think setting both the horizontal and vertical resolution when converting emf to jpg file as a hard task.If you can use a suitable software and take right converting method,it will be a piece of cake and time-saved. 1.Which software should be used? There is a kind of converting software called HTML Converter Command Line which allows you to create previews or thumbnails of web pages in a number of different formats, such as TIF, TIFF, JPG, JPEG, GIF, PNG, BMP, PCX, TGA, JP2 (JPEG2000), PNM, etc. HTML Converter Command Line also allows you to convert web pages to PDF, PS (postscript), WMF, EMF vector formats. You can download the software by clicking the link http://www.verypdf.com/htmltools/htmltools.zip. You should unzip the software into some location in your computer and you will see an executable file in the folder named htmltools.exe.It is the core of HTML Converter Command Line and the called program in the conversion of emf to jpg.HTML Converter Command Line should be registered before using,or some functions will be limited.You should run cmd.exe program first by pressing “Windows”+ “R” and inputting “cmd” in “open” edit box.Then change the current directory to the installation directory of HTML Converter Command Line by command “cd” and input the register code which you get when purchasing the software.Please see Figure1.After that,you can use HTML Converter Command Line freely. 2.What method should be taken? The method is composed of four parts—Run cmd.exe program,input command line and find the target file. If you didn’t close the cmd.exe dialog box just now,you can ignore this step.Or you should click “start”—“run” and input “cmd” in “Run” dialog box,then click “OK” button.Or you can use the hot key as mentioned above. The command line contains called program,parameters,source file and target file. htmltools.exe is the called program. 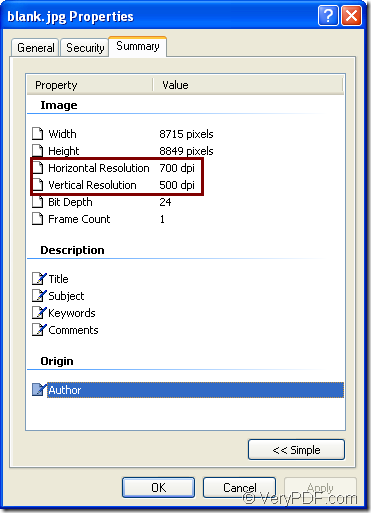 –xres value –yres value are the parameters about horizontal and vertical resolution. output.jpg is the target file. The following command line is the example in the conversion of emf to jpg. "C:\Documents and Settings\admin\Local Settings\Temp\htmltools\htmltools.exe" is the path of htmltools.exe which you can drag into cmd.exe dialog box directly. -yres 500 -xres 700 are the values of vertical and horizontal resolution.Y indicates vertical direction while X is horizontal. "C:\Program Files\docPrint Pro v5.0\blank.emf" is the path of source file.Of course you can drag the file into cmd.exe dialog,too. blank.jpg is the name of target file.You can specify the directory for the target file here such as C:\Documents and Settings\admin\Desktop\New Folder\blank.jpg.Then the file will be saved in the location C:\Documents and Settings\admin\Desktop\New Folder. You can find the target file in current directory. Please see Figure2.It shows the properties of target jpg file.You can see the horizontal and vertical resolution have been changed to 700 and 500 DPI. How to convert a document of mht to pcx image?